Creator and Founder Games Sepak Takraw "Father of Modern Takraw"
Or sepaktakraw takraw is a game between two teams or squads consisting of three players for each squad. Having a separate mesh between the two squads and played in the same ring size as a badminton court. Takraw ball was originally made from rattan and has now been replaced by the use of synthetic ball. Raga football was a game fondle takraw ball in a circle with legs or head and has been played since the Age of the Malacca Sultanate again. In Salatin Sulatus no telling about King Mohammed, the son of Sultan Mansur Shah Muhammad tanjaknya hit by a ball off the kick Tun Great sports. In Malaysia, the game is called 'sepak raga', in the Philippines 'SIPA', in Burma 'chinlone', in Laos 'kator', and in Thailand 'takraw'. Sepaktakraw Games present an adaptation takraw and badminton games. In the 1940 game was played on the net and in the scoring system such as badminton. Laws and regulations takraw net early in the game have been drafted and compiled in writing on 15 April 1960 in Kuala Lumpur. Mr. Hamid Bin Mydin is the person who is recognized as the creator and founder of Sepakraga Takraw. Who is Mr. Hamid Bin Mydin? What is the story behind it until he was recognized by the founder and creator of sepak takraw?? Who is the man who has served designers create modern sports football games using these nets? How he got the idea that the players use "Smashing Sharp" with head and "Kick of Death" to disable opponents move. The tactics of this amazing new in sports mesh football games began to be introduced in Jalan Patani, Penang in 1946. 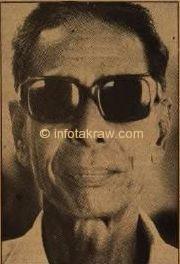 Hamid Mydin was born on December 19, 1916 and was then living in Patani Road, Penang. At that point, the game Sepakraga Circle in play in many places, especially in villages consisting of the elderly only. Young children begin to stay away from this game and Sepakraga Circle is losing its attractiveness. Viewers who watched the competition shall be counted with the fingers though the organizers providing the prizes. On top of these reasons prompted Hamid Mydin to transform and modernize Sepakraga game. Reflected in his mind how this game using nets and badminton courts. Hamid Mydin residence at No. 132H Kampung Rawa, Jalan Patani, Penang. Its history began when one afternoon in February 1946, Hamid Mydin has found friend named Mohamad Abdul Rahman, Jalan Hatin locals, Penang is renowned as a reliable player Sepakraga circle and tells his intention to transform or modernize this Sepakraga game by using nets and tennis as badminton. Located in an area on a layer of tarmac, the former site of the Patani Road Animal Hospital in Penang, Hamid Mydin using chalk outline, the line length is 44 feet and width of 22 feet. He then stretched hemp rope on existing poles 5 feet 3 inches tall. By using bad bolaraga and asked Mohamad Abdul Rahman stood on the other side and himself on the other side. They kick bolaraga go back the way one on one. That's the first time Hamid Mydin try new creations. On the evening of the next day in the same place, he tried to repair his idea to make the addition of 2 to 4 people and play a 2 player side. Not satisfied, on the evening of the third 6 players are used. His own in the skipper and two other players in front of him. Similarly on the other side Mohamad Abdul Rahman in front position (wedge) and 2 additional players as skipper of 1 person and 1 more as a wedge Mohamad Abdul Rahman. This new game since it got the attention of many. Young players started to leave the game circle and move to a more interesting game uses 3 players side and netting which was later renamed Sepakraga Nets. After the changes made by his play and the response from the public, including Thailand. His style of play is the result of several changes made ​​along Yusof Latif, who had held the post of Secretary General of the Association Sepakraga Malaysia. Blessing continued her work together Syed Abbas Al-Habshee. The introduction of this new style of play to people of Kuala Lumpur. They get encouragement and support from the Ministry of Culture, Youth and Sports Malaysia. In a short time the net takraw game started and competed in a covered stadium is no longer in the land of open spaces. Hamid Mydin Commanders are talking with Jones at the inaugural meeting of the "Committee of the federal sponsors Raga Football Netball Malaya" on January 28, 1960 in building No. Penang Malay Association. 160 Silver Road Penang. Malaysia's federal net Sepakraga established in June 25, 1960 at Community Hall, Jalan Patani Penang unequivocally recognizes and declares that HAMID MYDIN as CREATOR AND FOUNDER, GAME SEPAKRAGA JARING. YB Encik Mohd Khir Johari as the President of the federal Sepakraga Malaysian Netball Gold Medal awarded to Hamid Mydin Khir Johari in a ceremony held on August 7, 1977 in the hall of the Han Chiang High School, Penang. Penang Malay Association not lagging tribute to Hamid Mydin. He was awarded Sports Personality Sepak Takraw 1988. An exhibition about him was held at the National Museum from May 25 1979 to June 17, 1979 in conjunction with Malaysia's Sports Week organized by the Ministry of Culture, Youth and Sports Malaysia. Hamid Mydin creator and founder takraw game has been in the arena for more than 30 years of Sepak Takraw. He has proven to the world that Malay children can create a sports game especially Sepakraga Nets game that can be accepted by all nations. Especially sports fans takraw indebted to her. Hamid Mydin duly recorded in the name of Ink Gold as Creator of Modern History Sepakraga game or Sepak Takraw. Today's games Malay race heritage is not only known as the national game but in the international arena. In addition takraw, Hamid Mydin also active in UMNO politics Patani Road Penang branch. Hamid Mydin passed away at his residence No. EG-10 garden Abidin, Jalan Perak Penang on December 18, 1991 equals 12 Jamadil 1412H End at the age of 75 years and his remains are buried in the Muslim cemetery in Perak Road, Penang. "May his soul Hamid Mydin placed among those who Dear ALLAH "
Have any Comments or Suggestions or Opinions?